I’m excited to let you know that on the weekend of September 21st-23rd 2018, we’ll be holding a gala Tattoo event at The Palace of Fine Arts here in San Francisco. The event will encompass a 70th celebration retrospective of my career and life in Tattoo and be a vital fundraiser for a future permanent museum home for my Tattoo Art collection known as the world’s largest of its kind. Multiple exhibits on display from my collection will include much of the prestigious British George Burchett Tattoo Collection, hundreds of tattoo machines from my collection, and a unique personal exhibit of my history in Tattoo including original flash, machines, traveling tattoo outfits and photos from many of my greatest mentors and friends including: Bert Grimm, Doc Forbes, Tatts Thomas and Duke Kaufman. 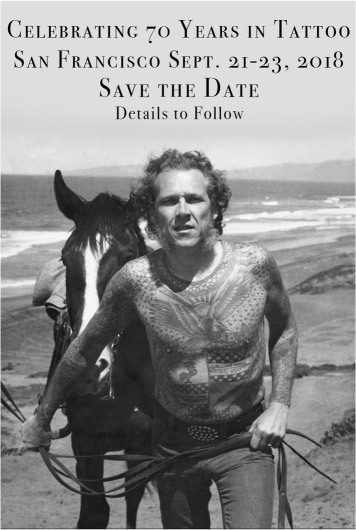 Displays will include original flash and personal memorabilia of countless tattoo icons from the U.S. and the world over, both famous and yet unknown to the public. I suspect there will be more Tattoo History than has ever been seen under one roof. But that’s not all! Two special friends from the Tattoo world will also be joining us and showing their amazing work. Famed representational figurative master painter and tattoo artist Shawn Barber will exhibit many of his enchanting tattooed subject paintings. My lifelong friend, photographer Dianne Mansfield, will create a gallery of her wonderful photography. Dianne became interested in tattooed people in the early 80’s and though some of her subjects are now gone, their images chart Tattoo History in a very personal way. We’re excited to say, we’ll have very special guest speakers throughout the weekend: All lifelong friends of Lyle’s, master tattoo and fine artist Don Ed Hardy, the one and only Leo Zulueta who popularized tribal tattooing worldwide, and trailblazing artist, personal friend and apprentice to Bert Grimm, Mary Jane Haake. And I, personally will give my insights on tattooing; past, present and future, looking back on 70 years of evolution in Tattoo since my career beginnings in the 1940’s. As noted in previous invites, Charlie Cartwright will not be able to attend due to a scheduling conflict. All event ticketing details will be available on our Instagram @lyletuttletattooshop and @lyletuttlecollection in the coming weeks. The weekend event will be an important fundraiser to establish new housing for the Lyle Tuttle Tattoo Art Collection for public view and research. We will hold an auction to include some of Lyle’s collection greats; including original flash, Lyle Tuttle and classic machines of the past pre-1975, and unique print and oddities, which will be an opportunity for tattoo history collectors not to be missed. Stay tuned for a full itemized auction listing later this summer. We’ll of course have many great collectibles for sale throughout the event including, original flash, Milton Zeis collectibles, vintage business cards and print. We’re proud to be reproducing special editions of Lyle Tuttle jewelry, and creating many exciting print and other special collectibles to mark the event itself, including a limited edition reissue of the Lyle Tuttle Body Shirt. Tattooing is the art that Art History forgot and is one that has enchanted me my whole life with its mystery and magic. So If you love and are fascinated by tattooing as I have been for over 70 years, you know where to be the weekend of this September 21st-23rd. This event will certainly be attended by many of the Tattoo luminaries of today and a great opportunity to meet, greet, and reunite with friends new and old. We'll announce new event details and music guests as we know more. The Palace of Fine Arts is one of San Francisco’s architectural gems and an inspiring place to host you all. Feel free to share the invite.